Simon Pegg is a comedic genius and is brilliant in any film. Apparently I am not the only person to think this either. 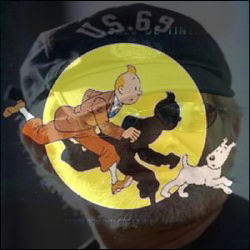 Steven Spielberg recently reached out to Pegg to visit him on the set of his newest film Tintin. Pegg who was finishing production on "How to Lose Friends & Alienate People" was extremely excited to meet the legend himself and hurried over to Spielberg's set to discover an empty set only to find Spielberg and a computer guy working. Pegg told UK Times about his set visit. "Steven’s smoking a stogy, cap on head, like he’s always been since I was a baby,” Pegg says, shaking his head in wonder. “I shook his hand and chatted about films. He gave me the mo-cap [motion-capture] camera, and I had a play around with it. 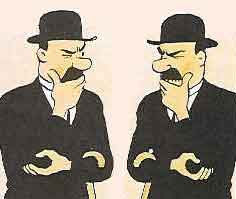 Then he said, ‘Hey, maybe you and Nick Frost could play the Thompson Twins.’ In Tintin. A Spielberg movie. To work with him is beyond .. . ” Let's just say Simon Pegg sounds titulated about the prospect of working with the master. So Spielberg would like the comedic duo of Pegg & Frost as the clumsy look-alike detectives the Thompson Twins, not the Synth-Pop 80's band (thankfully)! I think this is a perfect choice for the popular characters from the comic. The only question is, will Spielberg keep the duo's likeness in the final product? The Thompson Twins are look-alikes and the only way to tell them apart is the shape of their mustaches. Clearly the duo of Pegg & Frost are easily told apart, but with motion-capture the production team does not necessarily need to use the specific body shape. Remember Ray Winestone in Beowulf, sorry Ray, you have no where near those abs! They can have Frost and Pegg do all the voice work and physical action, but change their shapes so that they are indeed look-alikes. Simon Pegg does stress how enjoyable it was to meet Spielberg, but does not reveal if he will be doing the film. We are reminded that Pegg recently dropped out of Quentin Tarrantino's Inglorious Bastards due to "insurmountable scheduling difficulties," could Tintin be one of those difficulties? 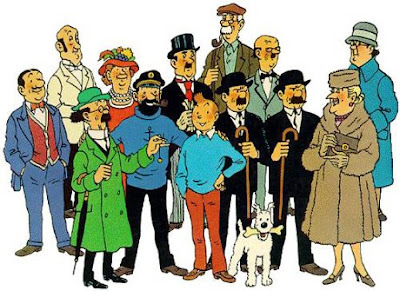 Thompson and Thompson provide much of the comic releif in Tintin and are always hellbent on arresting the wrong person, so again their characters seem perfect for Pegg and Frost! Pegg however, is also working with Frost on "Paul" a film the two wrote together in which two friends travel across the United States. 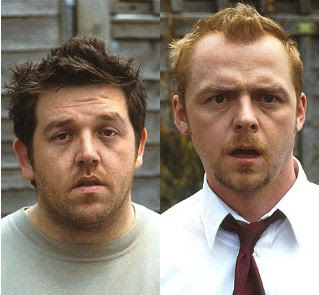 I am pretty damn sure that Pegg and Frost would jump at the opportunity to work with the guy who made iconic films like ET, Jaws, and Close Encounters of the Third Kind (wouldn't you?). What are your thoughts on Pegg & Frost in Spielberg's Tintin? How great is Pegg's work? Did you know that Nick Frost before becoming an actor, worked in a Mexican restaurant for six years as a bartender, waiter and cook? Wait, that isn't all that shocking is it?